A proper splitting axe makes splitting wood a much easier and safer task. A splitting axe differs from a chopping axe in the design of its head. The head head of a splitting axe widens right after the cutting edge; the whole head is shaped like a wedge. This design pushes the fibers of the log apart during the blow resulting in better splitting performance. The thinner head of a chopping axe is design to maximize the penetration power of the cutting edge. This makes a chopping axe ideal for cross-fiber work, such as cutting down trees. 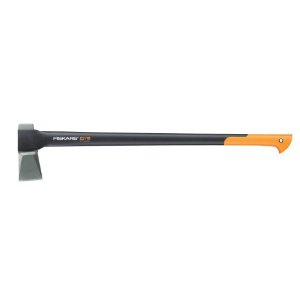 The Fiskars series of splitting axes offers several sizes. The weight of the head increases as the handle of the axe gets longer. While it is true that a longer, heavier axe has more splitting power, the longest axe is not a fit for everyone. Fiskars recommends the 36" model for users taller than 6ft. The 28" fits everyone else. An axe of the proper length will allow the user to work at his or her maximum potential. An ill-fitting axe promotes bad form, which tires out the user faster and creates dangerous swings. The handle of the axe is made from fiber composite, which is stronger and lighter than steel. The head is made from steel. Fiskars claims that the axe is virtually indestructible when used as intended. The head will not separate from the handle and it's impossible to bend the shaft with only the force a single person can create. During use the axe confirms these assertions. It's a pleasure to swing. I have had several over-strikes and other unintended misses. The handle did vibrate, but the axe was not worse for wear. The handle supports me jumping up and down on the center point while the axe is resting sideways between two chairs. I doubt two people doing the same thing could bend the handle. The stylish orange tip of the handle has the same grip coating as the entire shaft. The operator's hands slide up and down without catching anything. The grip coating provides just enough grip to allow for fixed and sliding hand positions. I prefer this coating to the feel of wood. The anti-bind coating of the head does work, but comes off way too easily. At first I could not make the axe stick in my chopping block. After only half a cord of wood however, the coating on the head came off the first half inch of the head. Now the axe does stick in the chopping block, which was actually a relief. That's the way I temporary store my axe while go and pick up the split logs. I do not believe the coating will wear off the entire head, even with heavy usage. The cutting edge and its immediate vicinity are subject to extreme forces. It's logical that the coating would not last long in these areas. Overall I think the coating should not be reason to buy this axe over another. It does not hurt, but it's longevity is in doubt. I used the axe to split a cord of Polar. A friend of mine had a tree removed from her property. The logger left the rounds for me to split. The work was challenging. At the base the tree was 30" across. This gave me a good range of rounds to test the Fiskars splitter on. The axe one-shots everything smaller than 10". 5" logs can be split by letting the axe drop under gravity. I was able to split logs as wide as 15-20" using repeated blows. Eventually, however, the rounds became so massive that even this splitter just bounced off. During the work, the axe never became stuck. A couple time I had to lever it out of a stubborn log, but I never had to use a second axe or a wedge. This alone is an incredible achievement. I am confident that I can process pile of 10" logs with the Fiskars axe as my only tool. On heavily knotted logs the Fiskars does not produce any miracles. These logs are just has hard to split was ever. The splitter does, however, do better than my chopping axe. Taller users like me will appreciate the extra length the 7884 axe offers. Having worked with shorter axes I feel working with the 7884 is easier on my back. Proper axe length selection is very important. The Fiskars Splitting Axe is a well built axe. Like the company claims, it will probably last a lifetime in a residential environment. 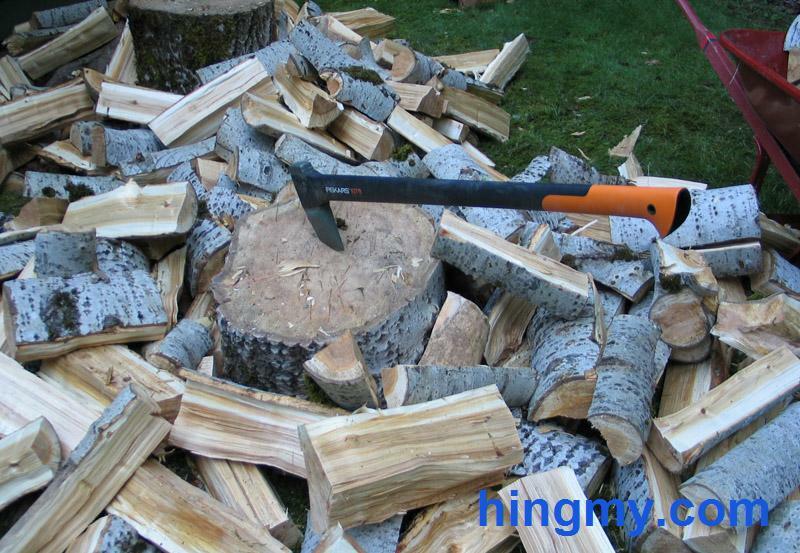 If you are planning to split logs no larger than 10", the Fiskars line of axes will serve you well. If you plan on working on larger logs, the Fiskars axe does not outperform physics. At some point the force a single person can create is not enough to overcome the wood fibers. If you are looking for your first splitting axe, the Fiskars series of axes will last you a lifetime. Few axes work as well as this one.